Samsung Electronics announced the official global launch of its Samsung Smart Home service, which makes home automation effortless and easy, with a single app. Samsung Electronics announced the official global launch of its Samsung Smart Home service. The service will first be rolled out in Korea and the United States, with more countries around the world added throughout the year. The service makes home automation effortless and easy, with a single app that makes it possible to connect and control home appliances, TVs and mobile devices. With the Samsung Smart Home app, people can control multiple devices simultaneously. For example, a user can simply say “Good Night” to the TV remote control, and connected devices within the home such as the Smart Bulb and air conditioners could be set-up to automatically turn off. Whether at home, at work, or out and about, people can use the app on their smartphone or wearable device to check the status of home appliances; for example, they can fully control the washer and select the correct wash settings for the laundry to be ready just when they arrive at home. All data that is transmitted by the app is encrypted for increased security. This ensures that the people can enjoy the service safe in the knowledge their data remains private. Users register for the Samsung Smart Home app with their Samsung Account. For smart phones, the app can be downloaded from Samsung Apps and Google Play. A separate app will soon be available for Samsung Gear 2 powered by Tizen and the app for Samsung’s 2014 Smart TV models will be available in April. Through the app, users can add and manage all compatible devices and appliances that are connected to the wireless home network. Once a device has been added to the Smart Home app, it can be set up with just a few steps using the app’s intuitive, easy-to-navigate user interface. Samsung Electronics plans to expand its service line-up to other smart products, including the Smart Bulb as well as robot vacuum cleaners and the Samsung Gear Fit. Each country and market has its own line-up and release schedule for products that work with the Samsung Smart service. 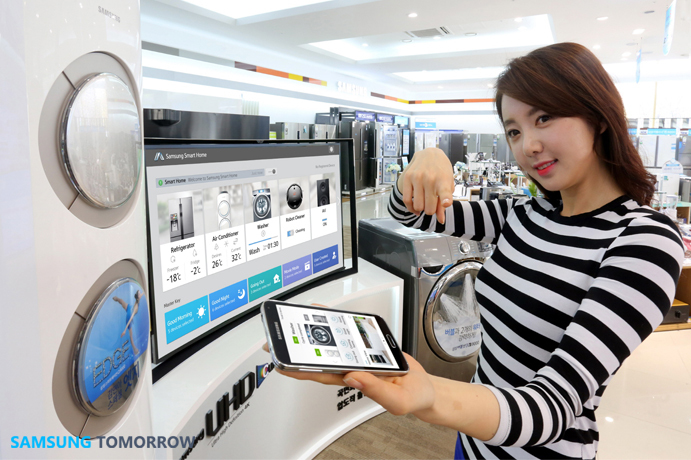 In Korea, the line-up for the launch of the service includes the 2014 air conditioner model (Q9000), washer (Bubbleshot 3 W9000), all 2014 Smart TV models, Samsung Gear 2 and smart phones that have operating systems above Android 4.0, such as the GalaxyS5. In the United States, products compatible with the service include the Samsung Smart French Door Refrigerator, the Samsung Smart Front Loading Washing Machine, all 2014 Smart TV models, Samsung Gear 2 and smart phones that have operating systems above Android 4.0, such as the GalaxyS5. Smart Bulb and Smart Ovens will be added to the service in the second half of this year, including the functionality for “good night” voice recognition.